I had the privileged of sharing my lecture Seasonal Quilts with the guild in McMinnville on Monday. Ruth was kind enough to share some of her photos with me. 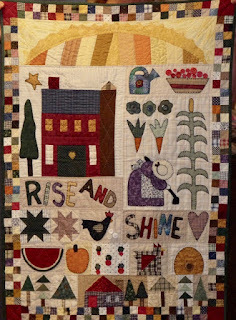 I started with fall quilts- the very first one I show is my first sampler (no photo) but this one shouts "AUTUMN" to me! I brought a few smaller quilts and happen to choose Country Roads. 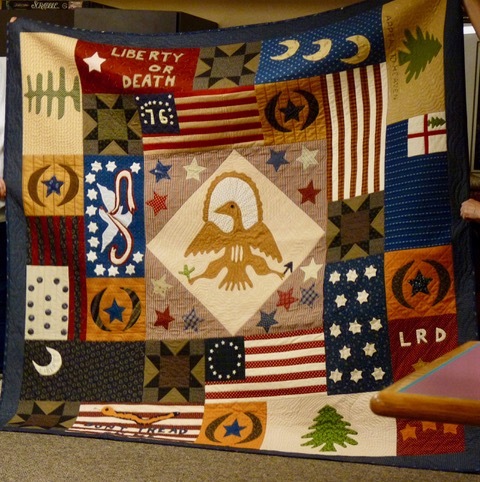 Mary Lu was a guest and happened to bring her Country Roads quilt too! Spring- This is a fun way to set exchange blocks too. 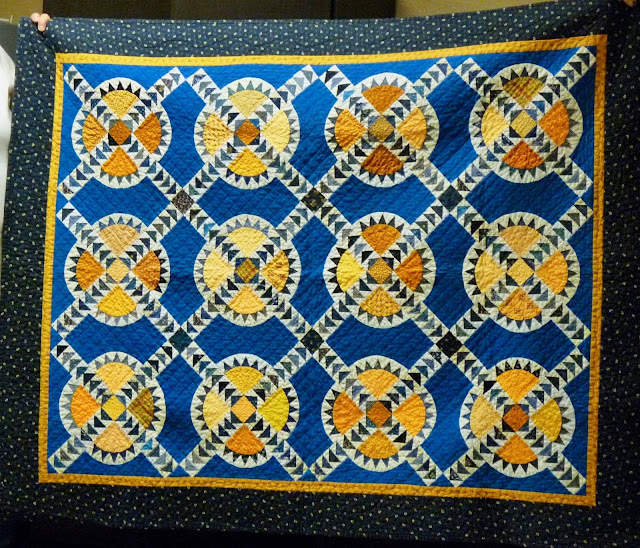 An old Country Threads quilt that I still love as much as when I made it! Summer. Here's my recently completed Flags of the American Revolution by Jan Patek. And we know there is a great woman behind every man, so that's why the Martha Washington block is on the back. Thank you all who attended, Ruth for suggesting my lecture to the president, Sally, JoAnn, Mary Lu and Tina for driving the extra miles to come and see the lecture. I was thrilled to meet you all! I'm open to presenting at other guilds if you are looking. I can do 3 different lectures and a workshop. And on another note: My son and his girlfriend surprised us yesterday and showed up! 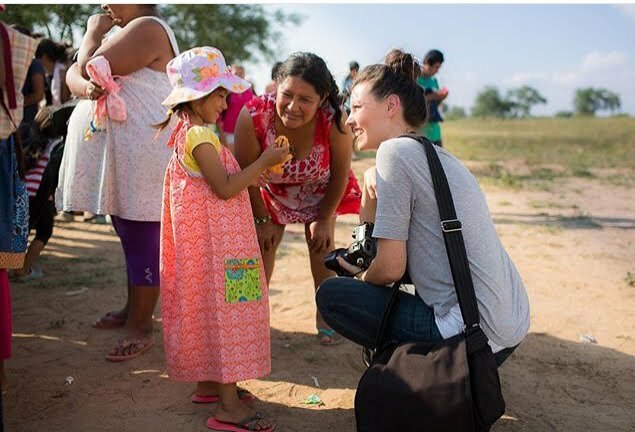 They have been traveling the world and are home for a little while now. Looks like a great show. Would have loved to have been there. Have to tell you something silly. When I saw the first photo of the woman holding your Country Roads, before I read about it my mind thought, "Oh, she made a larger version of Country Roads." When I saw the second photo of it I realized it was too great a coincidence that there would be two "larger versions". Then it clicked--I was the one who had adjusted the size and had made smaller versions. What a happy surprise to have your son arrive. That is a good surprise!! :0) I bet your trunk show/lectures are wonderful! 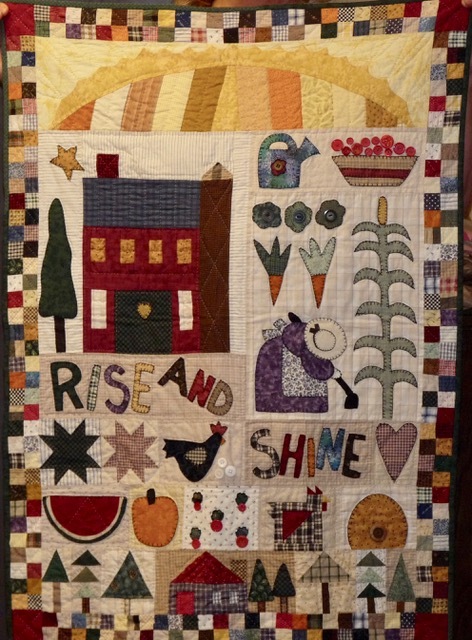 Lovely to see your quilts here and Ruth's post beautifully showed lots more. I love the chimney sweep with the pink zigzag setting!! 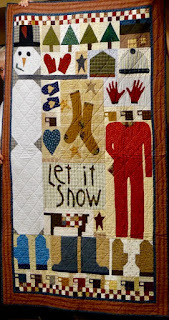 Fun to see your quilts! 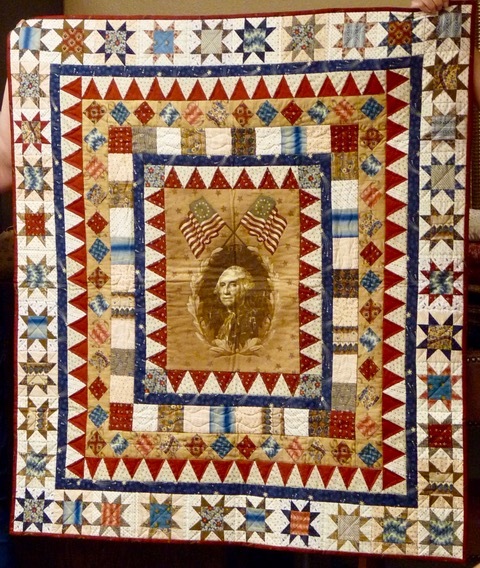 Love George Washington and Flags of the AR :) Still quilting mine! 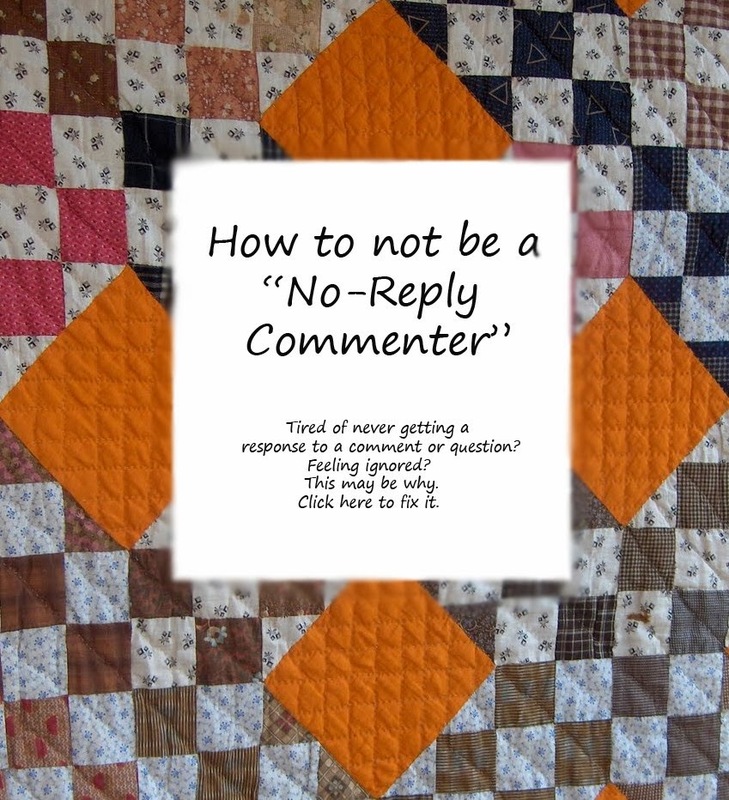 Your quilts are wonderful. I love seeing them. What a wonderful surprise. Enjoy their visit. 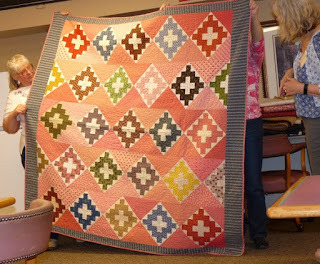 always fun to see the quilts you've made - bet it was a great evening. I'm sure your lecture and trunk show were wonderfu! I wish I could have attended. Thanks for the photos! 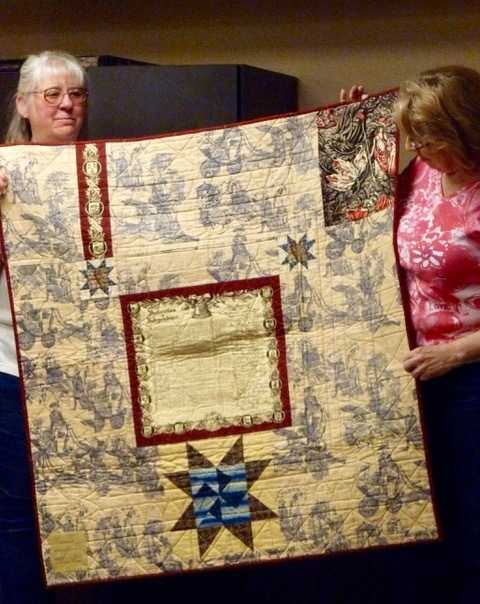 How creative to have the Martha Washington on the back of the quilt. Good thinking and oh how true. I really enjoyed seeing your beautiful artwork. It helps seeing things like this to help me take my mind off of things. Thanks for being a friend! Lori...such a lovely lady taking that photo! 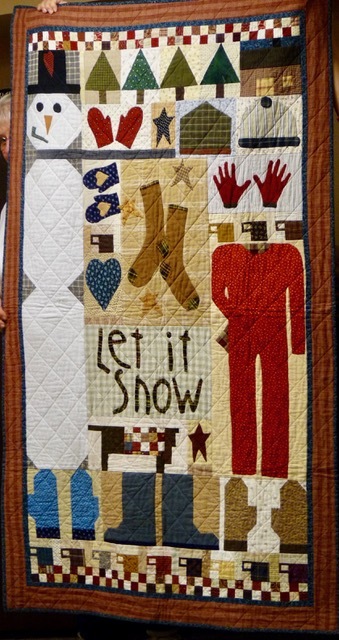 All the quilts are awesome. So much talent. Thanks for sharing. Looks like it was a great show! And Kenny is back! YEAH. Are they just passing through? Or home for good?? This, That and The Other for Friday.